I was trying to edit this into a coherent piece but that is not going to happen so here it is, as is: full of random info. Warning — this may become more common! Mia’s umbilical cord (aka, her stinky stump) fell off on Tuesday, when she was 6 days old. I’m so glad Jenny told us that the cord becomes quite stinky…because it was alarmingly so! This is one of those things I certainly hadn’t thought about. Her diapers aren’t stinky since she only eats breast milk, so we would have been very confused. We had some near hysterical moments of laughter during the last couple days with the stinky stump hanging on. We gave her her first bath the day after her cord came off, when she was 1 week old. Mia, 6 days old, with umbilical cord still hanging on. Just as we were told, the meconium was nasty stuff and we are so pleased we spared our diapers from that icky-ness. Actually we barely spared Papa from the meconium! It was pretty funny…of course, we left Mia in her birthday suit for as long as possible after she was born. She peed on Aaron about 3 times the morning she was born, and she had her first poop about 30 minutes after we put her diaper on! Hee hee! We were very entertained. Also, shown above you can see Mia in her prefold diapers and diaper covers. They are working very well and we have the laundry routine down. 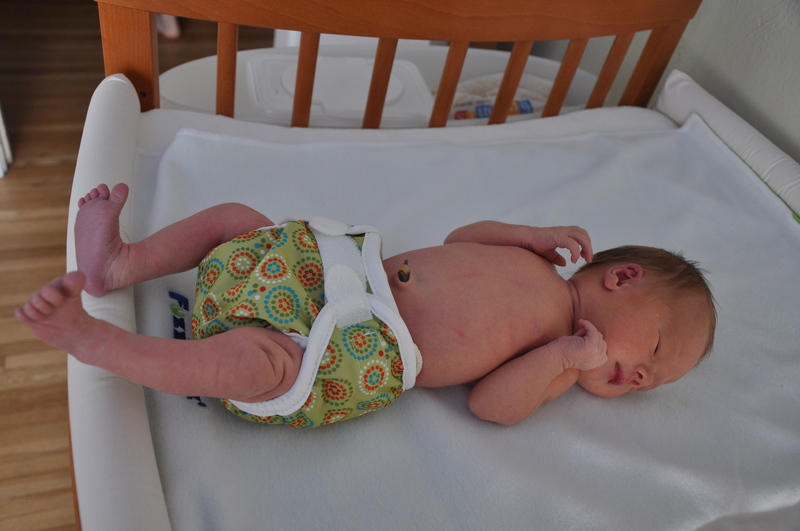 Today was the first day we didn’t put her diapers out on the clothes line to dry (because it was raining). 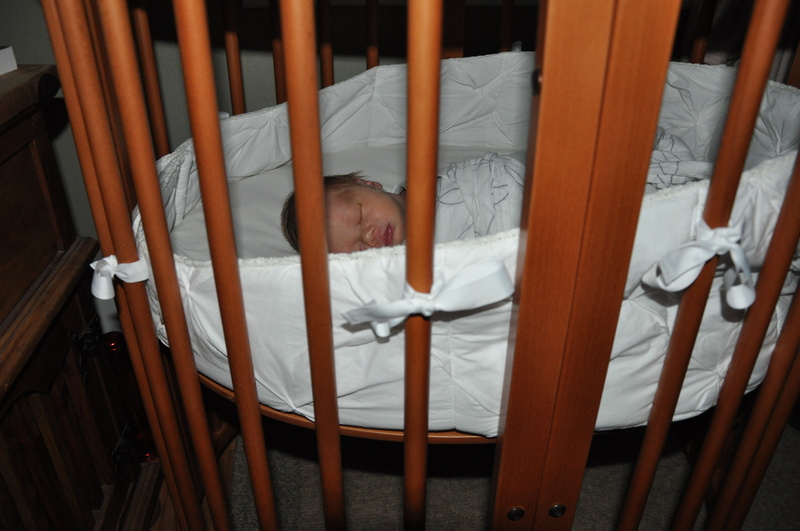 Here are a couple more pics showing Mia sleeping in her bassinet, and my view of Mia in her bassinet. 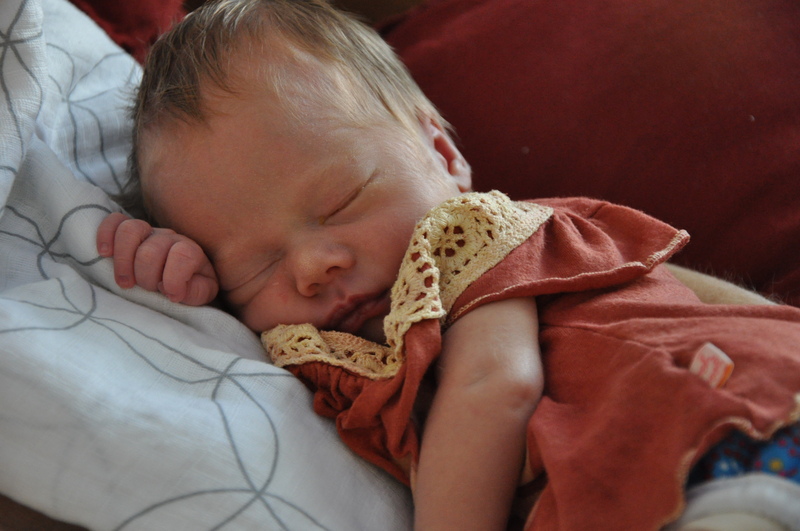 You can see she is expertly swaddled…she sleeps very well like that. Aaron is the swaddle pro, aka Baby Whisperer. We highly recommend the book, “Happiest Baby on the Block”; those methods work like a charm. 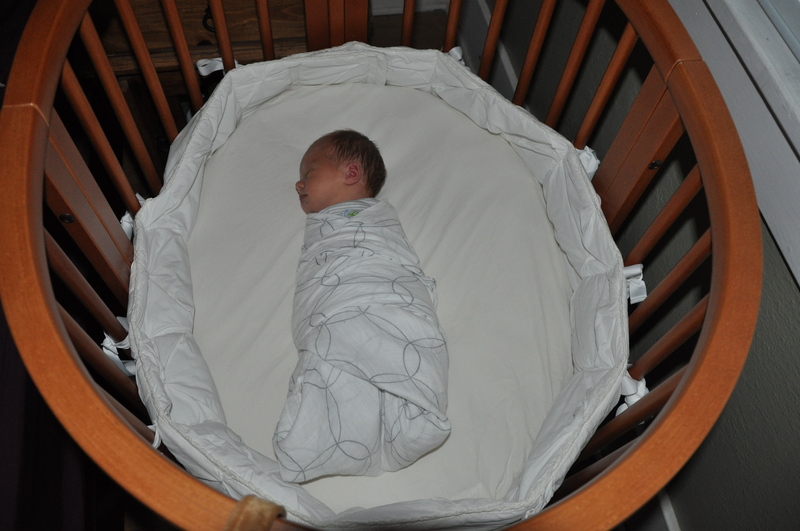 It takes practice and patience to get the swaddling down, but it is so worth it. I think it is good for all of us: Mia sleeps better, we sleep better, thus we’re all happier. And we had our first family outing in a car today! We all went to the grocery store together; Aaron carried Mia around in the Ergo/sleep machine. First time we have been the car seat, and in the car. We had taken several short walks previously, including a trip to our favorite seasonal market, but no motorized expeditions until today. That’s all for now. More random posts later. This entry was posted in Diapers, Mia. Bookmark the permalink.